The Missouri SILC is looking for people who are knowledgeable about Independent Living to join the Council. Thank you for visiting the Missouri Statewide Independent Living Council website! By federal law (The Rehabilitation Act of 1973), each state and US territory is required to maintain a statewide independent living council (SILC). The Council and the Centers for Independent Living (CILs) within the state develop a State Plan for Independent Living (SPIL). The SPIL is a document required by law that indicates how the IL Network is going to improve independent living services for individuals with disabilities over the next three years. It identifies the needs and priorities of consumers, providers, and other stakeholders and sets forth goals and objectives to respond to them. Having a strong network for independent living in a state or territory is crucial. Collaborating on the SPIL development can help create a cohesive and unified vision among all stakeholders who have an interest in issues that impact citizens with disabilities. The most recent SPIL was submitted in June 2016. 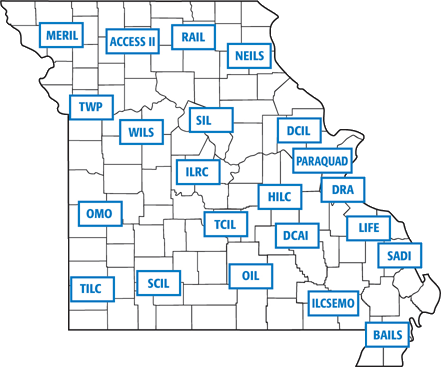 To get involved in Missouri or to get more information about the SILC and the IL Network, click on Centers at the top of this webpage to find a CIL near you. The Missouri SILC invites you to join us at one of our quarterly council meetings.